The Patient List, under "Reports" allows you to run complex searches and generate specific lists from your entire patient panel. Every list that you generate, you can then export to an Excel-compatible spreadsheet for further analysis. You can also download a list of all your patients' full demographic information (address, phone numbers, etc) at any time. 1. Start by selecting the group of patients you'd like to search through. 2. 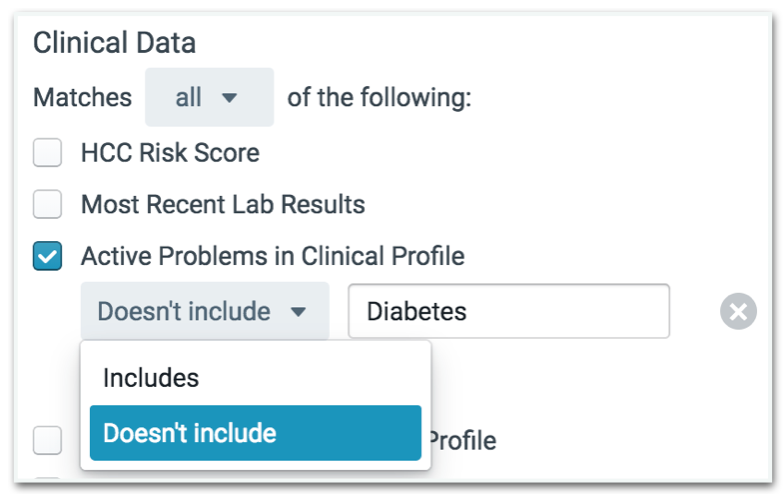 Select the search filter criteria for your patient list. You can filter by multiple criteria at once - e.g. age, gender, active problems, and active allergies. Find the full list of criteria below. *Patients are classified as belonging to a given provider if that provider is listed as their Primary Provider in Practice in their demographics. Search for patients with an HCC Score Above, Below, or Between a certain number. Add problems to this filter by name or ICD-10 code. Only patients that have your specified problems listed as Active in their Problem List will appear in the search results. You can combine your search terms to look up information, such as which patients do not have diabetes, but do have hypertension, and are taking Captopril. It's also possible to specify strictness of your query. Do you want to find a list of patients that meet all of the specified criteria or any of the criteria? 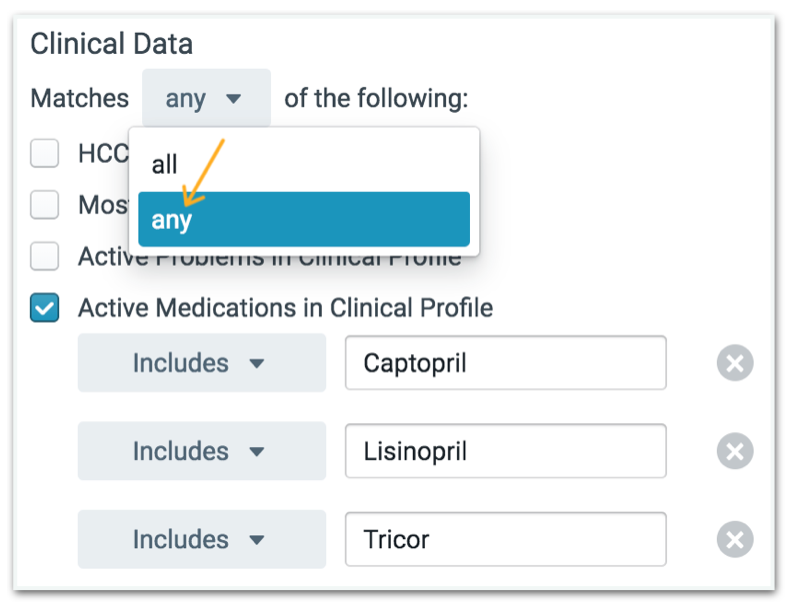 For example, you can check if patients are taking one of a variety of drugs, by selecting the “any” option, as seen below. 3. 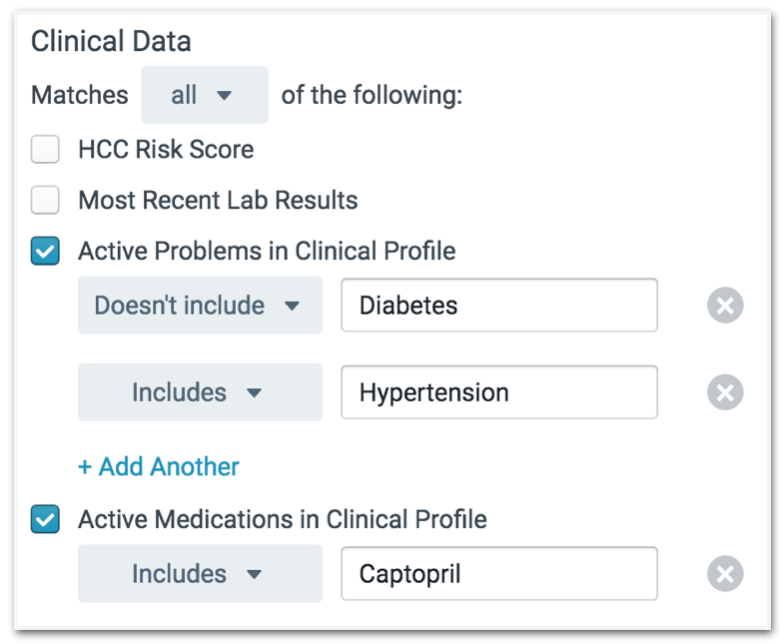 See your entire patient panel by setting the filters 1. Provider --> Entire Practice; 2. Last Seen --> Any Date, then clicking "Generate List". Patient Name: "First Name, Middle Name, Last Name"
*Contact Method is obtained from the "Contact" field in the Patient Details dialog in the Patient Chart. You may sort the Patient List report by Name, HCC Score, Date of Birth / Age, Gender or Contact Method by clicking on the Column Headers. Clicking on the patient name within the Report will also open the Patient's Chart. To print or save your patient list export, click "Download CSV" to save the list as an Excel-Compatible file you can open and edit on your computer. If needed, you can do more advanced data analysis in Excel. Questions? Please reach out to support@elationhealth.com.